About six years ago I attended a Golden Gel Mediums workshop with an all-day hands-on demonstration of all the possibilities of their various gels and texture mediums. Since then, I’ve used more and more texture in my paintings. This morning I came across a 10-minute video Patti Brady’s Rethinking Acrylic: Encaustic Effects With Acrylic Paint which shows some of the ways acrylic gels can be used for an encaustic look. 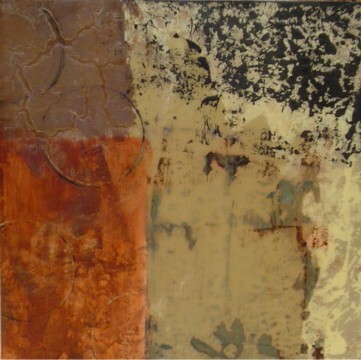 I’ve had a fascination with encaustic forever. I’ve done a few encaustics, but one needs to make a complete commitment to the setup required to do them on a regular basis. I haven’t been willing to make that commitment, even though it does call my name occasionally. So from time to time, I like to play with acrylic mediums to get an encaustic look. The painting shown above is one that I pushed in that direction. Yet another, more detailed demo on the same technique is in this video. This page will give you links to more demonstration videos in the Golden Paints library. If you can find one of these workshops in your area, I highly recommend it. I don’t advertise Golden paints. I just happen to love their products. I don’t use them exclusively, but I do have quite a stash of them. Martha, I took a one day workshop here in Phoenix to find out I DIDN’T want to do that, especially in our incredibly hot summers. Probably saved myself $$$$$. I still love the look however. Barbara, do you mean you found out you didn’t want to do encaustic? If that’s what you meant, I’m with you. There are other reasons, like having to always keep the finished work temperature controlled, etc. As for the acrylic gels, I love doing texture with them. The possibilities are only as limited as your imagination. Yes, that’s exactly what I meant. I wasn’t sure I wanted to go full force into this medium so just took a one day workshop. It was interesting, but not for me. I also use acrylic gels for the “look”. I think it’s a great way to go! Encaustic paintings will not melt unless the indoor temperature is over 160 degrees, for heaven’s sakes. If you have candles in your house and they don’t melt on their own, encaustics won’t either! If your house is over 160 degrees inside, then encaustics won’t work. Your house must be very hot, Martha! Anywhere you have wax candles that don’t melt on their own, you can have encaustics, for heaven’s sakes! Thank you, MJ. That makes me feel a little better. Except for the fact that you do have to take special care when you store and ship them. They are beautiful and the surface effects are like no other. I’m with you on the encaustics, would love to play but not willing to make that kind of commitment at this point. So playing with Golden’s mediums and creating the effect is the way to go for me, appreciate the links. Wonderful piece you created. Love all the amazing creativity on your blog, and look forward to trying this out. Acrylic mediums can be so addictive! Thank you, Bella! So nice of you to stop by. I checked out your blog and love your ideas for kids and for us grown-up kids as well.